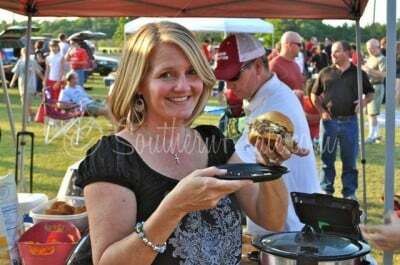 Italian Beef Sandwiches – Great for tailgating, Easy for Supper! If you are on FB, please click the little like button above. Thanks! I hope you all had a great Labor Day weekend! We decided to hit the road and spend the extra few days with the Georgia Jordans and just got back in last night. The kids really enjoyed playing with cousins and grandparents and the hubs and I enjoyed sitting around visiting. Okay, so I might have gotten a wee little bit of shopping in, too, but the North Georgia Premium Outlets just say my name so sweetly that whenever I am near it is hard to refuse. We left out on Friday around lunch and decided to take backroads in order to avoid the perpetual traffic jam just outside of Chattanooga. Note: We love everything about Chattanooga. It is one of THE most family friendly places on earth and we dearly love to visit there every chance we get. But seriously, there is almost always a traffic jam just outside of it. So you can either hang on to your bladders and hope you get through in an hour or so, or you can go through Mentone :). Filet Mignon- The way we cook this steak makes the cow’s death a more noble cause than anyone could have ever thought possible. Rolls – Just like grandma made and served hot enough that the butter will be half melted just by sitting on the same tray on the way to the table. Tea – Iced. Sweet. Good. Required with every meal. As we headed out of Mentone on the little winding mountain road, our road trip bliss was interrupted with a very sudden WHOMP WHOMP WHOMP WHOMP. You got it folks, we have us a flat. About that time two teenage boys appeared from inside the house and stood staring at us from a distance so I smiled and approached them to explain what had happened. They leaned on their father’s tow truck (which I had previously viewed as a sign Ricky might have more help than me with the tire) and said “Yeah, thats what our dad said probably happened.” I apologized for us being in their driveway and they said “Well, good luck with the tire” and turned to disappear back into the house. Sure, it could have just been a flat tire. But it could have been the one thing keeping us off the road when an eighteen wheeler veered a little too far to the left..or when a deer ran across our path, or when someone who was dozing off turned onto the road without checking traffic beforehand. Whooooweeee Dawgie! See what I mean about not halfway doing it? You hungry yet? Lets get on in that kitchen and cook us up some grub! I get bored taking ingredient photos in the same places all the time so today I took my ingredients into the living room. This is what my mantle looks like now. Okay, so I don’t really have a *real* fireplace but I’ve always wanted one so a few years back I saved up and we got an electric fireplace. It still puts out heat and has a beautiful fire look to it, but it’s not real. I’m cool with that though, I have a good imagination and someplace to hang the kid’s stockings on Christmas Eve :). I had it all decorated at one time and it was actually pretty, too, but time and kids tend to redecorate your house and that isn’t always a bad thing. Ours is much more colorful now :). 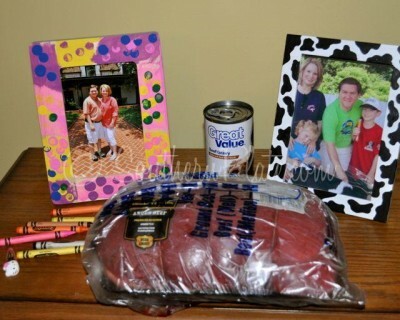 So here is my beef roast and can of beef gravy posing on my makeshift mantle with some painted picture frames, crayons, and a hello kitty hair barrette. Woo, I’m feeling chatty today! Okay, I’ll try to actually get through this post now. 1-2 bottles of Zesty Italian Dressing. You’re also going to need 1-2 Bell Peppers and 1 Onion. I say “1-2” bottles of dressing and “1-2 bell peppers” because it really depends on how much you like them and how much flavor you want from them. Me? I could drink a bottle of Italian dressing and eat every bell pepper you put in front of me. I only used one bottle in this but I sometimes add another half bottle or so just to up the zingy flavor. 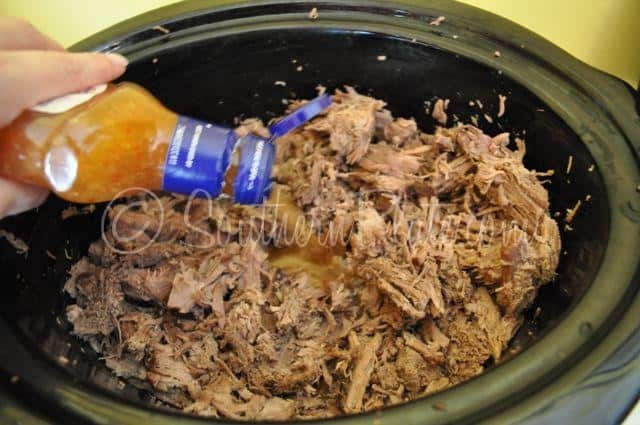 Place your beef roast in a slow cooker (my favorite kitchen appliance!) and cover with can of beef gravy. Put lid on and cook on low 7-8 hours or high 3-4 hours. * Note that you are not using your Italian Dressing now. After it has cooked all day, remove the roast, drain off and discard all juices, shred the meat and return to the slow cooker. 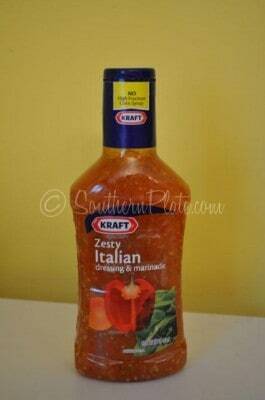 Add in entire bottle of Zesty Italian Dressing and give it a good stir. 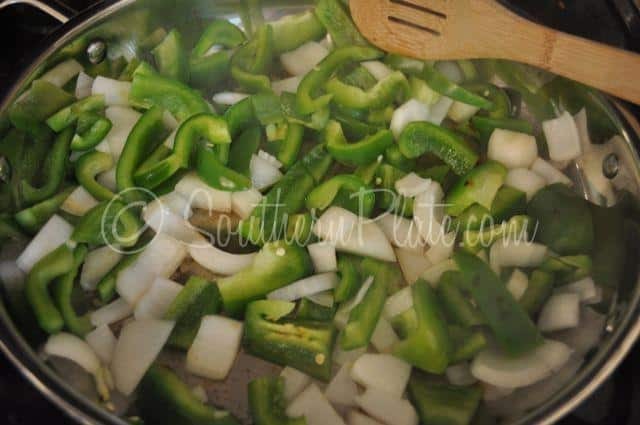 Chop up your onion and bell pepper and place in a skillet over medium high heat to brown slightly, until your onions are caramelized and your bell pepper is tender. I don’t add anything to this but if your skillets tend to stick, you might want to add a tablespoon or so of cooking oil before adding in your veggies. and cook it until you get tired of fooling with them and want to get on with things. Add them in with your beef and give it a good stir. 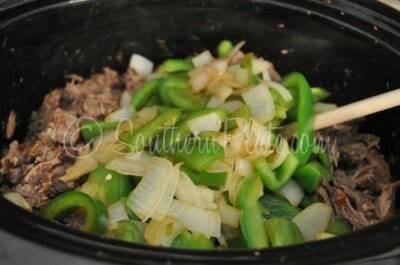 Place slow cooker on warm setting until ready to serve. Serve on buns, topped with mozzarella cheese. Special thanks to my friend, Tammy, for modeling the sandwich for me! 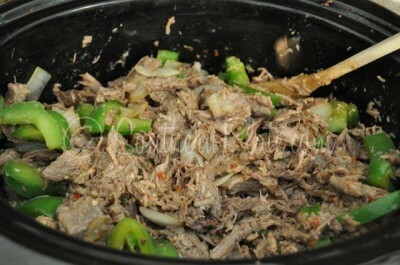 Place roast in slow cooker and pour can of beef gravy over. Cover and cook on low 7-8 hours or high 3-4 hours. 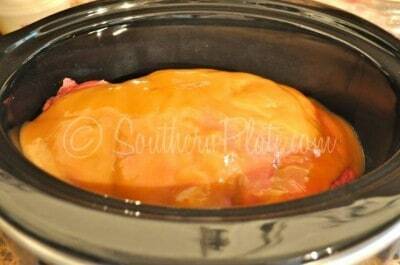 Remove roast from slow cooker and discard juices. 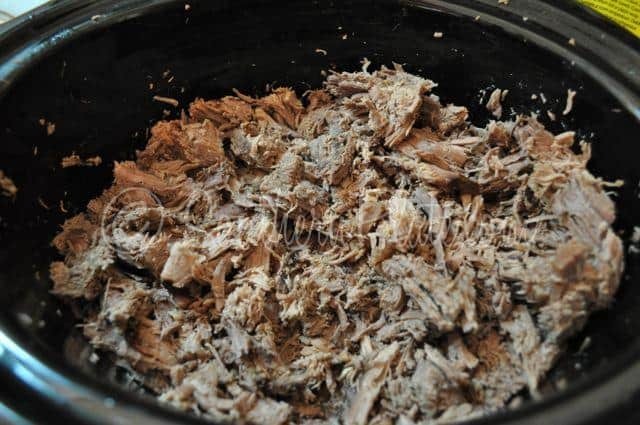 Shred meat and return to slow cooker. Pour bottle of dressing over meat and stir. 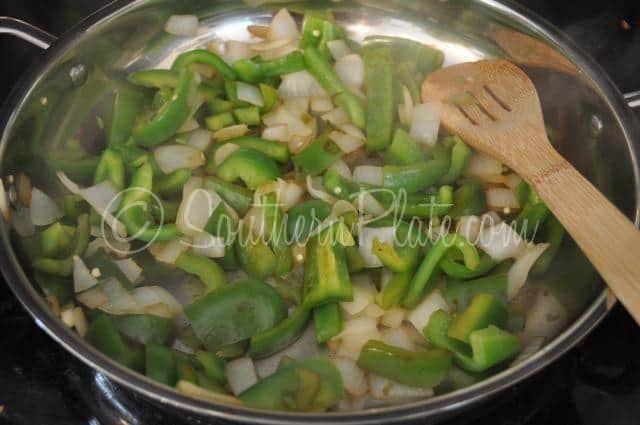 In large skillet, place onion and bell pepper. Sauté over medium high heat until tender. Stir into beef mixture. Cover and place on warm until ready to serve. Serve on buns and top with mozzarella cheese. I like to start each day with a positive or uplifting message on our Facebook page each morning – and I sure do hope you’ll join us over there if you haven’t already! Today’s message bears repeating so I’m adding it here, too! this looks great to make on football Sundays…. Now I’m kicking myself because I love garlic too!!! Yummo!! I wonder if mushrooms would work too. Did the Outlet shopping come after toothbrush shopping. LOL. Nice meeting you again, in the same place ironically. ~giggles~ How crazy is that?? The two times I’ve been to Georgia this year I run into you BOTH times at Wal Mart!!! lol I expect I will see you once more before the year is out!!!! My mom & I had a flat tire on 20 right outside of ATL. A trailer with a race car & (all that goes with it) pulled over to the side of the road right behind our car. 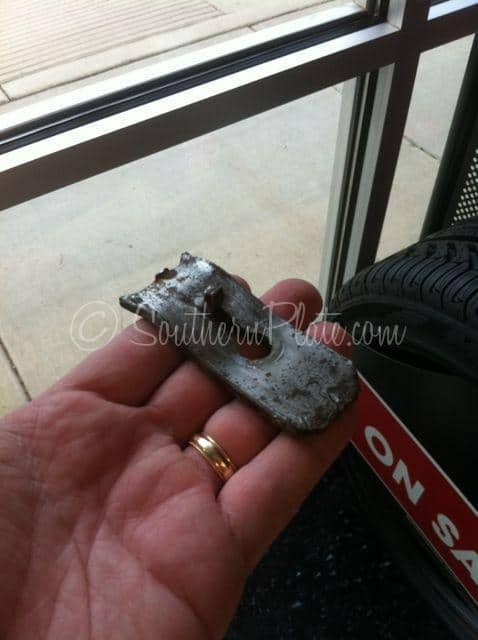 All the guys got out & we thought we were getting ready to have some help with our flat tire. WRONG!! They walked right pass our car & us headed to a restaurant. Evidently, they couldn’t park the trailer in the restaurant’s parking lot. So much for Southern Chivalry…. (& I’m SOUTHERN!!). Hope they lost the race! Hehe. Just joking…(not really!)…. Oh my word, my mouth dropped open reading this just as I’m sure yours did when you experienced it! This is just a call to raise our children to know better! If Yyu’re IN OR NEAR Atlanta, Call the HERO truck, They will come with a hydraulic jack and change your tire faster than you think is possible. No charge and you don’t tip them. Great guys, We had our s in the HOV lane. We needed to change the passenger rear tire. They stopped all lanes of traffic while crept across the interstate. He blew the horn when we were about half way. It sounded like a train, Almost scared me to death. I always wonder what we may have happened when something unexpected happens. There is usually something that makes give thanks when that happens. I do believe that everything happens for a reason. <3 and Hugs! This looks yummy Christy!! I’ll definitely be making this!! 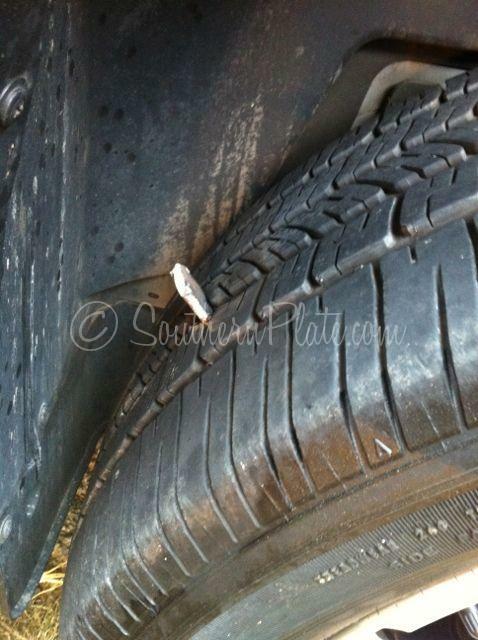 I’m so glad you all were safe – like you said, no telling what that flat tire kept you from! God never runs out of ways to protect us!! We’ve always felt the same way when something happens before or during a trip. Sometimes we’ve seen what we missed, other times not, but we are always grateful for God’s protective hand, however the help comes. mmmm that looks good. Since I need to restock my refrigerator/freezers after our visit from Hurricane Irene I will definitely keep this one in mind for my shopping trip. Ok my shopping trip is delayed until 1) all the spoiled stuff is thrown out (don’t want to kill the garbage men) 2) everything has been cleaned and sanitized and 3) I can go do some serious shopping again. Probably this weekend. Thanks for this recipe that looks super simple, super tasty and great for a crowd! Help! I want to print this recipe!! What is the zip list and how does it work??? Kat, just highlight the recipe, press control+c, open a new document in your word processing program and press control+v to paste. Give it a name and save it. Sorry, this was for Cathy in Birmingham. Not being able to print it is my error. I’m working on fixing it now, thanks for letting me know! Zip list is Awesome! Login with your fb or you can create an account and save all the recipes you like to your own recipe box online. It works with several food websites, too! We used to live about a mile from the North GA outlets. That was dangerous to live so close!!!! I have a roast in the freezer that has this recipe written all over it. Thanks Christy! Just seeing that beef made my mouth water. I would like it on my plate with crusty Italian bread as I am not much for sandwiches. Pass the cole slaw or potato salad too! Shame on those boys for not helping you out, but I am a firm believer in what goes around comes around. They should have been thinking of how their momma might have been in the same fix and they would want someone to assist her. I hope my sons would do better. Ya’ll do things like I do, Christy! I had an entire screwdriver minus the plastic handle in my tire! All the way! Glad everything turned out ok! This is my second or third visit to this site and I really do like it. 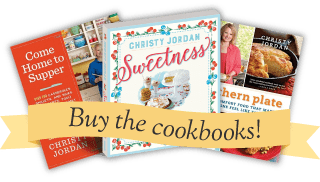 I have your cookbook, Southern Plate, and it is great. I will have to try this recipie for Italian Beef as it is different from the recipie I use. I am another Alabama girl as I live in Sylvania. Be back to this site soon. Hi Charlotte!! Welcome to Southern Plate. I am so glad to hear that you are enjoying the site and the recipes!! We are very blessed Mary, very blessed!! That sounds tasty. I’ll give it a whirl. Just wondering how come parents don’t teach their kids manners anymore. Poor teachers at my William’s school are so amazed by his 4 yr old manners. And, you know when something goes wrong with the car I think the same thing and just thank God. I hope you enjoy the recipe Teresa!! well gee, guess I missed you at the Outlets!! We love going over there, someday I hope to be able to “run” into you at Walmart, LOL, but kinda doubt that will happen. I know that the car problem is a way we are kept from harm, many times I have left a bit late, or had a problem of some type, get down the road and bamm there is a huge truck up a pole or a train just clearing the intersection. I’ve always believed that we are held back for some reason. Take care and Thanks again for allllllllll that you do!!! You never know Marianne, it might just happen one day. Please make sure to say Hi if it does!! Receipe looks yummy – next on the list to cook! Did you try the sweet potato biscuits at the Wildflower Cafe? WONDERFUL expecially after you pile the butter on….It could be part of the winter menu – we were there after the big snow. Is there a reason you don’t save the liquid, de fat it and use it for soup later? Makes home made soup quicker and easier. Yummy sounding roast. recipe, love, love love my crock pot! I just don’t have the storage space right now and wasn’t planning on making soup or stew soon but you certainly can! Yum! Thank you for sharing this recipe. I can’t wait to make it! I hope you enjoy it Lisa!! Christy What a great recipe. We do something like this with a pork roast. meet you there for lunch. I live in Ga and fairly close to the outlets. Love to go there and shop and people watch. We live in Chattanooga. You are right ~ it’s a great town! We’ve eaten at Wildflower Cafe in Menton. And I had the tomato pie. It IS yummy!! Pick me, Christy! Pick me!! I know what I’m making for the game Saturday! Thank you SO much for your web page. I am the only person on the planet that doesn’t have a smart phone so I have to go to your page 80 times a day so I don’t miss a post. When you cook the roast do you put any liquid in other than the beef gravy?? Can’t wait to try this roast but making your chicken stew recipe today!! Nope, no other liquid. It’ll make a good bit more. Save me some stew please! Hope you enjoy it!! when arriving home from work says “Welcome”! !